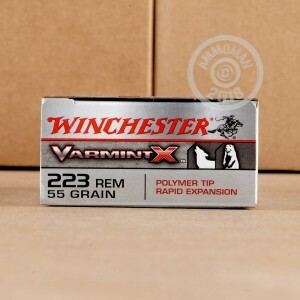 This .223 Remington ammunition from Winchester's Varmint-X line will work with your AR-15 or other .223/5.56 NATO rifle to make quick work of anything from coyotes to squirrels! Each cartridge in this box of 20 fires a 55 grain polymer tipped hollow point bullet designed for rapid expansion and fragmentation to bring down annoying critters fast without overpenetrating. 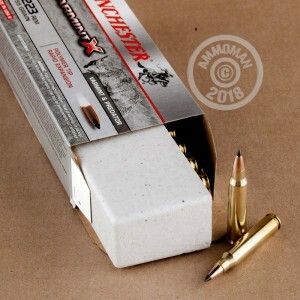 These cartridges have similar external ballistics to M193 ball ammo (55gr. bullet, 3,240 fps muzzle velocity), making it cheap and easy to get your optics sighted in. 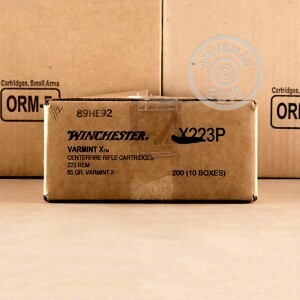 Winchester ammunition is loaded in Oxford, MS using non-corrosive Boxer primers and reloadable brass cases.